TL;DR – Webmatrix 3 is cooler than you might think. 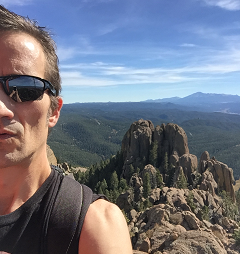 It offers a very convenient set of features which to my mind are a complement to, and not replacement for, a more robust development environment. Particularly for doing quick touch-ups to HTML or CSS for an existing site, tracking such changes in source control, and easily publishing the updates to Azure or your standard hosting provider. 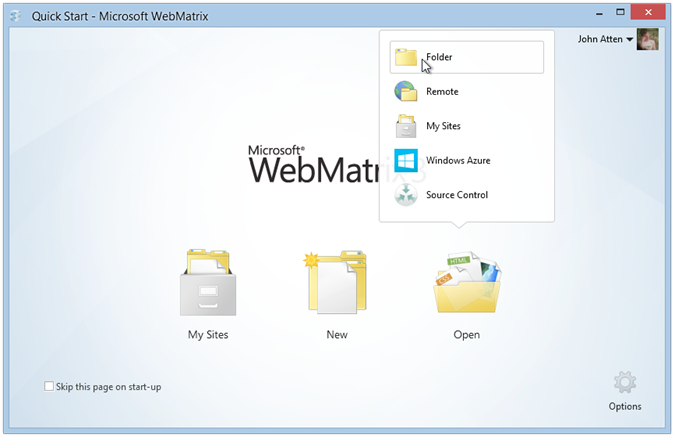 The addition of source control integration and Azure deployment make Webmatrix exceptionally useful in addition to your more robust development tools. 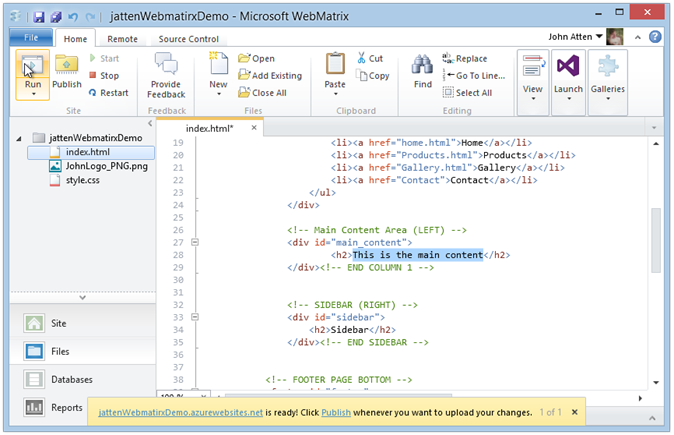 Microsoft Webmatrix 3 will never be confused with a full-fledged application development tool. 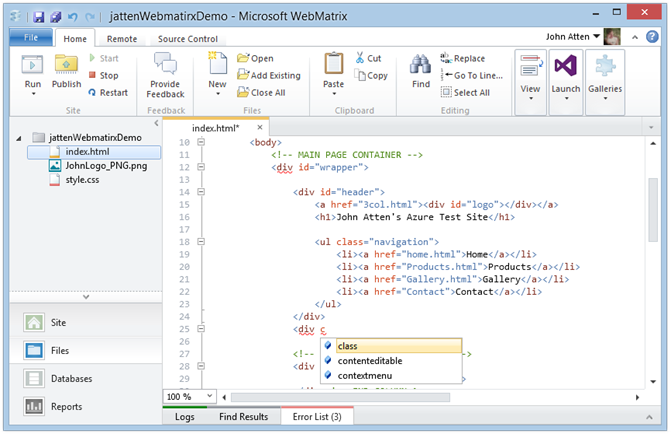 Nonetheless, with the version 3 release of this lightweight, free suite of site creation and management tools, Microsoft has, in my opinion, hit something of a sweet spot in tooling for easily building, deploying, managing and maintaining basic web sites and/or sites created from various template packages. Let’s face it, these days, if you need a simple blog, CMS, forum, or other tried-and-true site category, odds are good you will not be rolling your own, but instead using (perhaps with some customization) an existing package such as WordPress, Joomla, Orchard CMS, or some other framework. Or it may be that you are creating a simple static site which does not require a full complement of development tools such as Visual Studio. Webmatrix 3 provides a handy set of features for maintaining and deploying changes to a site without having to crack open a full solution in Visual Studio. Minor tweaks to HTML or CSS are quick and easy. Also, one of the highlights of this new release is some basic source control integration, notably absent from previous versions. Lastly, built-in deployment to the Windows Azure platform, either directly using Webmatrix, or by hooking your Azure-hosted site up to your project repository such that pushing to branch master automatically publishes changes to your live site. While in some ways Webmatrix looks a little like a toy, I strongly suggest that you give it a closer look before dismissing it completely. Using Webmatrix 3, it is possible to get a basic site up and running quickly and with little fuss, particularly for those who need little more than to deploy and lightly customize templates available in the extensive Web Application Gallery, included out of the box. Also notable is that, since version 2, Webmatrix supports Node.js an PHP, in addition to the expected ASP.NET Web Pages. 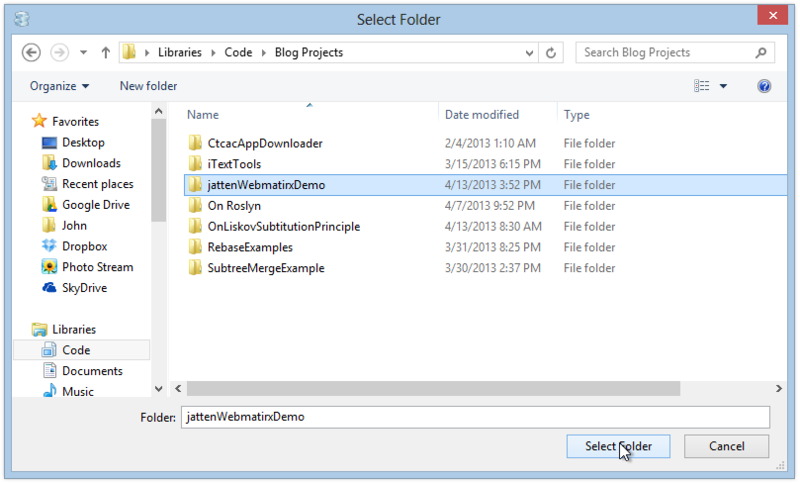 The most attractive feature of the new release, for me, is the source control integration. When you click on the Source Control tab at the top of the editor window, you are presented with a choice to use Git or Microsoft’s own TFS. Personally, I have no use for TFS, so let’s see what the integrated Git offering is all about. The GUI-based Git functionality provided here is very basic. To perform any but the basic functions identified by the ribbon items available in the window shown above, one must crack open the Shell. One complaint I have is that the “Shell” icon seen in the picture above does not open a standard Bash command shell (which is what I have become accustomed to with Git) but instead a Windows Powershell CLI. 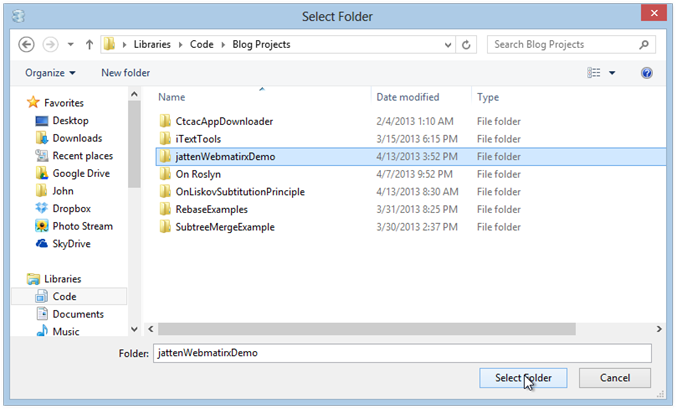 Webmatrix Git integration appears to depend on libgit2Sharp, a .NET wrapper for the C-based libgit2 port of native Git functionality into a portable, platform-agnostic library of core Git functionality. While I am not fully-versed on the implications of this, I DO notice that the Git/Bash command line interface, as made available in Webmatrix, is not the same as I am accustomed to, either in msysGit (on Windows) or when using Git on my Linux box. While most things appear to behave in a (mostly) familiar way,I found it disorienting at first (no doubt this is a reflection on my unfamiliarity, and not the implementation). I will be doing some more exploring to see what the differences are here. On the other hand, if I am needing much more advanced Git/Source Control functionality, no doubt I should probably be moving to a more powerful tool altogether. Another option is to use the standard Git for Windows command line when such advanced git features are needed (provided you have Git for Windows or msysGit installed). Happily, on the “Home” menu tab, there is a “Launch in Visual Studio” button. In other words, when you need more power, it’s there (provided you have Visual Studio installed). If you develop for the Microsoft stack (and even if you don’t) it has been difficult to miss the growing presence of the Windows Azure platform, and specifically, Windows Azure Websites. 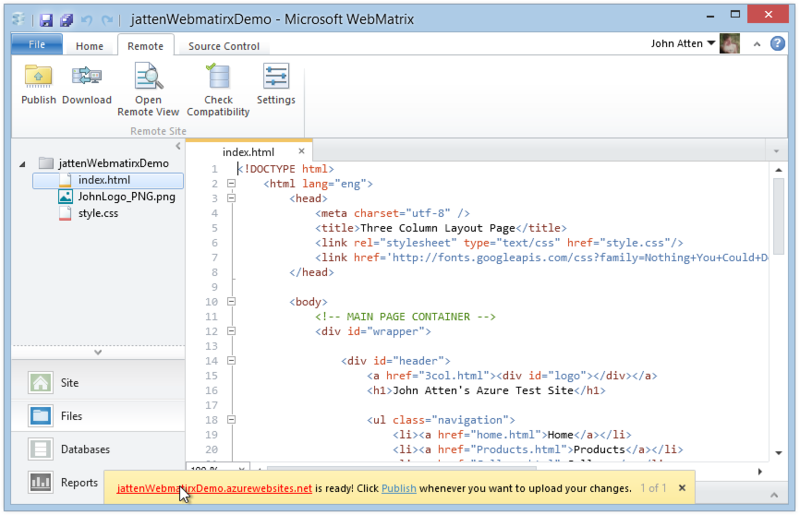 Currently, you can create up to 10 sites on the Windows Azure platform for free. There are some trade-offs, in that under the free model, you can’t use custom domain names, and there are some resource limitations. Additionally, it looks like upgrading to the paid model might quickly become more expensive than traditional shared hosting. However, the Azure platform as a hosting provider shows increasing promise, and some very cool features. As with most Microsoft products, integration with their Windows Azure platform has become a first-class citizen in Webmatrix 3. From the minute you install the product and run it for the first time, you are presented with opportunities to add your Azure account (if you have one) or create a new one ( if you don’t). 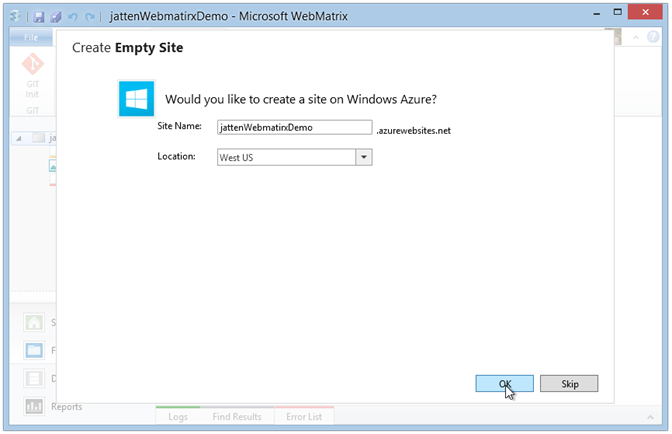 Likewise (and more pertinent to this article), there are multiple ways to rather seamlessly take advantage of Azure as a host for sites you create in Webmatrix. Once you click “OK” your existing site will be provisioned on your Azure account, and publicly visible at the link you see in the yellow notification box at the bottom of the screen. At this point, I can work on my site locally, and test changes by running it in the built-in IIS development server installed with Webmatrix. If I like what I see, I can then use the “Publish” button to automatically upload my changes to the live Azure site. Of course, publishing directly to an Azure website is only one of the simplified deployment options available in Webmatrix 3. Also present are standard Web Deploy and FTP deployment settings so that changes to your site can be easily published to the hosting provider of your choice. Webmatrix 3 is cooler than you might think. It offers a very convenient set of features which to my mind are a complement to, and not replacement for, a more robust development environment. Particularly for doing quick touch-ups to HTML or CSS for an existing site, tracking such changes in source control, and easily publishing the updates to Azure or your standard hosting provider. 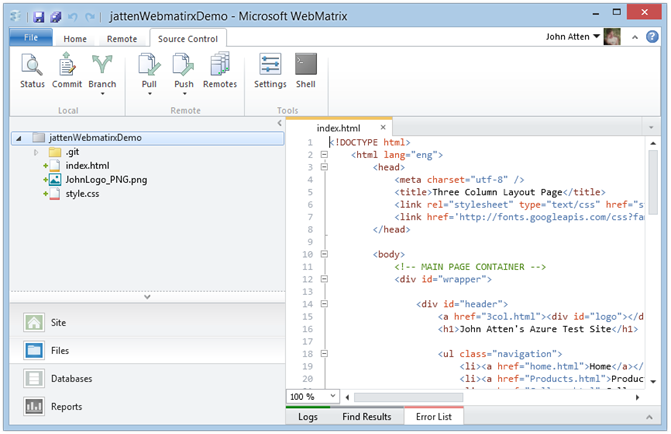 The addition of source control integration and Azure deployment make Webmatrix exceptionally useful in addition to your more robust development tools. There is a rich set of basic features for common deployment and site maintenance scenarios available here. While as I have said, Webmatrix is emphatically not a full-fledged development tool, it is a handy addition, particularly for quick and dirty site creation and maintenance, or for those who need a simple, easy to learn way of getting something published on the web.